The winners will be announced February 20, 2019 via a follow-up release, with physical awards to be presented at the 2019 Natural Products Expo West in Anaheim, CA, which expects to exceed last year’s record-breaking attendance of 85,000. SnackNation’s proprietary data platform SnackNation Insights offers product intelligence gathered from millions of consumer insight data points to empower CPGs with the knowledge to understand consumer preferences and behaviors. 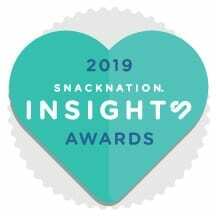 SnackNation is a tech-enabled snack delivery service that serves today’s most innovative, best-tasting, and emerging CPG brands to high-value consumers at their most engaged moments. SnackNation exists to inspire more conscious food decisions. Founded in 2014, the company curates and delivers great tasting, better-for-you snacks to half a million people, both at home and in thousands of member offices nationwide – places like Microsoft, MailChimp, Soothe, and many more. SnackNation is committed to helping families facing hunger, and has donated more than five million meals to Feeding America. SnackNation was named the 24th fastest-growing private company by Inc. Magazine and the third fastest growing company in LA county by the Los Angeles Business Journal. SnackNation has offices in Los Angeles and Chicago, to learn more, visit SnackNation.com.